Stage and theatre lighting design uses your technical and artistic skills to specify equipment and create the look of a production. Planning lighting positions and communicating your ideas by drawing a lighting plan used to involve what was called techincal drawing but pens and paper have given way to CAD – Computer Aided Design. So, where do you get some FREE stage lighting CAD symbols…? Plus a new lighting symbol library for Open Office Draw. On Stage Lighting runs CAD training courses that are delivered worldwide using a custom online Virtual Learning Environment (VLE). Online courses include training in AutoCAD and Vectorworks Spotlight for use in the performance industry. If you would like to access one of these, just fill in your email in the box below to join the Learn Stage Lighting Guest List (MailChimp) and I’ll let you know as soon as the next course is running. Join the Guest List and get more! There are CAD video resources at the On Stage Lighting YouTube channel, including tutorials on using AutoCAD for stage lighting design theatre and moving your learning between AutoCAD and Vectorworks. We also have series of screen tutorials on using Vectorworks Spotlight 2010. On Stage Lighting has been visited by many budding lighting designers via searches for “theatre lighting symbols”, “Stage Lighting DWG” and other lighting CAD related topics. Unless you are lucky enough to own a genuine stage lighting CAD package, as outlined in Stage Lighting Design Software .. you might be struggling to find a free source of theatre lighting symbols to use in your CAD. Luckily, the lovely people at theatre CAD specialists Modelbox have a stash of free lantern symbols, including the old Strand Patt. lanterns that still survive in schools, churches and small theatres everywhere. The lighting symbols of these ancient lights are familiar to “old lags” of lighting, being hand drawn using a Rotoring pen and green plastic stencils. So, enough rose tinted memories – what theatre lighting symbols have they got? Modelbox have kindly provided .zip files of each lighting manufacturer plus a complete package. Each symbol file is in .DWG format (R14 release, if you are interested) which is a standard CAD format that is supported by all CAD packages and also vector drawing software such as Adobe Illustrator and Corel Draw. The files also contain attributes/layers of other stage lighting information such as channel, focus, colours etc. which make them extremely useful when used in conjunction with a CAD software which allows full use of attributes. You can use these to plan gel cuts, patch and dimmer information. Selecon – Symbols for the Selecon ranges including Acclaim fresnels, spost and floodlights. So, there’s some free CAD symbols for your next lighting design. The package does not have any intelligent lighting, moving lights or LED fixtures but these are usually available in .DWG and .DXF formats from the lighting manufacturers anyway. Has this been useful to you? Click below with your answer. Yes, this information is valuable to me!! More information about the stage lighting symbols files are on the Modelbox website. Update: Mark Lautman has given us a heads up about his new theatre lighting symbol library for Open Office Draw. If you don’t know, Open Office is a free suite of products similar to Microsoft Office – we use the word processor and spreadsheet programs in this office. I haven’t used Open Office Draw but assume it similar to MS Draw or Visio and Mark has developed a number of native symbol libraries including one specifically for stage lighting planning. Check out the OO shapes and let us know what you think. I am looking for 3d cad blocks of band members and instruments. I don’t know of any FREE band members blocks but if you need free CAD models then Google Sketchup 3D Warehouse is a good place to start. If you have Sketchup PRO, AFAIK you can export as DWG/DXF. Hi there, nice little package you have here of the lighting fixtures. I was just wondering if you may be updating them soon? to include LED fixtures, moving lights etc? Once again, thanks nice little package! The symbols belong to Modelbox, who have them available on their website. As the package is fairly old not, I assume that they will not be updated to include newer fixtures. Looking for CAD blocks of the Selecon Pacific , Acclaim and Rama ranges . Any help is appreciated ! Thanks a lot for the huge amount of CAD symbols given here. I really appreciate it but, are they on 1:1 scale? I know how to re-scale them in AutoCAD using the measurements from each product’s technical specs as a guide, but is there a bug or something affecting the real scale on the CAD blocks? Thanks for telling us about your scale issues. The files are not provided by On Stage Lighting but are available from the Modelbox website. I didn’t know of any problems but they are free. There is also another AutoCAD / DWG lighting symbol resource @ the Cue1 Lighting website. 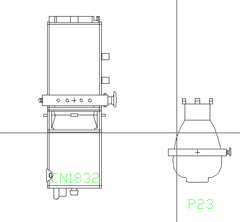 Could you recommend a free CAD programe that the above lantern symbols can be used in? The lighting symbols are all in DWG or DXF format and many free 2D CAD packages support those files. A free version of TurboCAD was available from FreeCAD.com last time I looked, along with other drafting software . Google Sketchup (also free) can import the symbols too. Thankyou soooo much, I have been looking for this everywhere and conteplating just giving up and handing over a dogeared chocolate wrapper with my lighting plan on the back then running away! I guess you;ve got to start somewhere!!! The ETC blocks are worthless as posted here, being that they are not even remotely close to being in scale. For all of you with scale issues, you’ll definitely need to re-scale each block. I’m in autocad 2010 educational – I run the block editor and re-size using the scale command and a tape measure. Once you’ve got that, you can add a lighting legend and save it as a template. I’ve made templates for each of the venues I’ve designed at in the last six months and it makes you popular with other designers. Remember to leave a blank template with your house tech. You could check out LXFree as a passable free lighting plot package – it does fairly well with basic plots and will automatically generate fixture lists and the like. We have lighting fixtures, truss, audio, venues and much more. Hi Mike. Thanks for all your knowledge. i have a issue. When import a dwg on vectorworks. i ready made it. But i can´t use it or modify. i can’t no transform on object or symbol.